Shepherd’s pie is a firm favourite for tasty family meals. There are many variations on this traditional recipe and depending on your family’s favourite foods you can serve a nutritious meal that will not cost a lot of money to prepare. Traditionally a shepherd’s pie is made with minced lamb however it is more economical to make it with minced beef that can be up to half the price of lamb. If you purchase the cheaper less lean minced beef drain off any excess fat when browning the meat. Adding as many vegetables as possible to a shepherd pie will not only mean you do not have to prepare vegetables separately but it also means you have provided your family with most of their required number of vegetables for that day. Try cooking leeks if using lamb mince as the two complement each other. 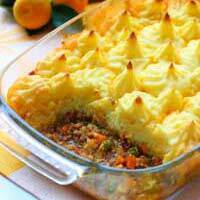 Shepherd’s pie is an ideal recipe for freezing. Apart from making family sized meals, why not make a few individual portions so that there are meals stored in your freezer for days when you are home alone and do not want to cook. Preheat oven to 200 degrees C gas mark 6. Peel and quarter the potatoes into even sized pieces and place in a pan of boiling salted water. Bring back to the boil and simmer until cooked through. Drain the water away and mash the potatoes with the butter until thick and creamy. Meanwhile, heat the oil in a deep pan and fry the onions until they are clear. Add the minced meat and garlic and fry until the meat is browned. Drain off any excess fat from the meatbefore adding the carrots, canned tomatoes and the stock cubes. Leave to simmer for twentyminutes adding a little water if there is not enough liquid to cover the meat and vegetables. While the meat is simmering put the lentils into a pan and cover with water. Bring to the boil and simmer until the lentils are soft. Drain and add to the meat. Add the button mushrooms and the frozen peas plus enough gravy granules to make a thick gravy. Season to taste. Drain off excess gravy into a jug and save to accompany the meal. Place the meat mixture into an oven proof dish. Top with the mashed potato and fork over the top so that it has a rough surface. Dab with pieced of butter before placing in the oven for thirty minutes or until the top is browned. Serve with the heated gravy. By draining off the excess gravy you will find that the meat should not burst through the potato whilst cooking and make a mess in your oven. It will also keep the potato firm and not sloppy. @eddie. To freeze the Easy fish pieomit the hard boiled eggs. Make the pie up to the stage where you would place it in the oven (but do not do so). Allow it to cool then freeze. To eat- remove from the freezer and allow to defrost, then bake as stated in the recipe.